I love Japanese service, but it is very egalitarian or even the power relationship is at times reversed, such that the service personnel appear superior to the customers that they are serving, while maintaining the highest verbal standards of humility of course. Once again, as one Japanese hospitality researcher commented, the attitude to deities parallels the attitude towards hosts. Japanese deities, kami are perhaps better translated as spirits, and are seen in a much more egalitarian way than the Judeo Christian God, as are the ancestors who are "worshipped" which for similar reasons is better translated, in my opinion, as "respected". The above uses the kimono clad lady in the image below released under the same licence. There is a common misconception that the Japanese are sheep, lacking in autonomy, and creativity compared to Westerners. This is due to logocentricism - the tendency to over-emphasise the importance of words. Westerners are loud, autonomous, and creative with their words, whereas Japanese tend to follow Benjamin Franklin's advice to, “speak little, do much.” Nowhere perhaps is this difference more pronounced than in food preparation services where, to some extent similar to Meg Ryan in When Harry Met Sally, Westerners like to read menus, give orders, and have others adjust their food to their liking. The Japanese on the other hand would not be so outspoken as to order others around (as they hate to be ordered around themselves) but will delight in being given the opportunity to cook, and choose how they cook, for themselves. The cultural difference is not in the degree of autonomy nor creativity, but in the modality of self-expression. Japanese hospitality is famous for its attention to detail. Visiting guests are wowed by free toiletries tea and even a change of clothes in Japanese hotel rooms, the offer of free chopsticks when purchasing take-away food, the pouring of sake till it flows out of the glass, cabbies that open doors for their passengers, bags for umbrellas at the entrance to stores, and even the hooks for bags next to Japanese ATMs and toilets. Japanese hosts, it is claimed, read the minds of their guests to offer them more than they even knew that they wanted. The kindness of Japanese hosts is wonderful when it is appreciated, but sometimes foreign guests may wish to avoid some of this attention to detail. 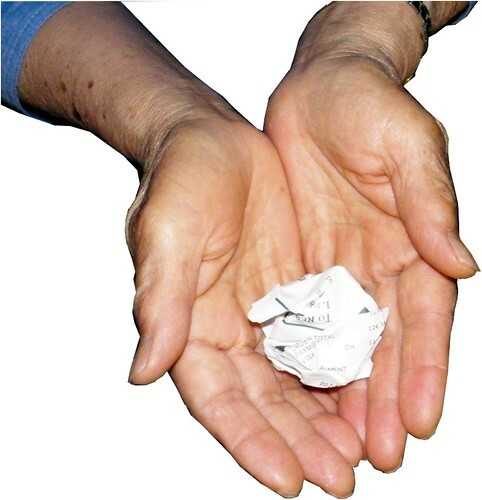 Customers do not always want wrapping nor till-receipts. Sometimes they may feel embarrassed to put their trash into their host’s hands. Customers, who are unaccustomed to the practice, may not enjoy their host talking in a high pitched voice, nor even being offered a chair to sit down. 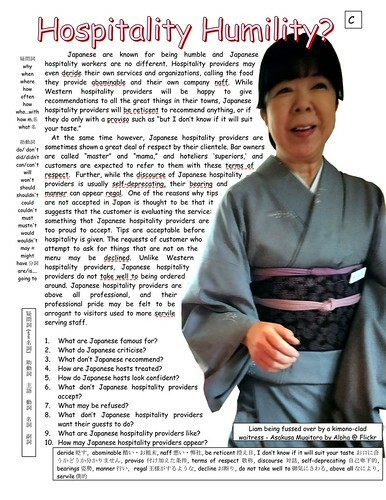 All the same, these details are often difficult to avoid because, rather than reading their guests minds, Japanese hospitality providers are often just following a preset script. In Japan it is often said that “the customer is God”, and this is often true, but in other countries Gods are spoken to and their commandments obeyed, rather than being the recipients of ritual. I am not keen on the extremely, and perhaps overly, polite and kind Japanese tendency to encourage guests to put guest rubbish (trash) into the outstretched hands of the host, especially when the item I want to throw away is something that I have had in my mouth like a lolly pop stick. I would be most grateful if Japanese service providers would instead pass me a bin (trash can) but that would for them involve the trauma of showing me the contents of their trash can / rubbish bin: or in a sense showing me their dirty laundry. Perhaps I should take my lolly pop stick home like any self respecting Japanese person.